In this post, we discuss the many benefits of music therapy as applied to addiction treatment and rehabilitation. There is no questioning that music has an immensely positive effect on our mental state. Music helps us to examine and make sense of memories in a non-intimidating manner. Music also allows us to rid ourselves of negative emotions and traumatic experiences so we may live happier and more fulfilling lives. Music has been used to treat a number of ailments such as Alzheimer’s, depression and Parkinson’s. It’s only during the last decade that music has been used to treat people who suffer from addiction. Music therapy has particularly gained popularity amongst addiction therapist since the general rise in the use of holistic therapies in this area. Addiction therapies favour music therapy because it helps to encourage client communication and to also reduce anxiety surrounding the therapy process. This is why music therapy is often considered to be a form of complementary therapy. Some clients make slow progress when traditional talking therapies are not supported by complementary therapies. This is because talking therapies are fairly intrusive by nature. Complementary therapies serve to ‘warm up’ clients so they are then more responsive to traditional talking therapies. Music therapy is highly effective in meeting this aim because it is considered to be so non-intrusive. It’s also important to stress that music therapy must not be used in isolation when treating addiction. Instead, music therapy must be used in combination with psychotherapy, counselling and other evidence-based treatments. Music is unarguably integrated into human history. Like ourselves, music also started life in Africa where tribes use drums too for a variety of different reasons. Ancient Greek and Asian cultures also well-documented their use of music. Music is literally present in all cultures across the globe. This suggests that the love for music is ingrained into our DNA. It wasn’t until the 1970s that music began to be officially recognised as a form of therapy. Now, music therapy is utilised at all stages of addiction therapy from intervention, rehabilitation and aftercare. Because music therapy is a highly effective means of treating addiction, it is likely here to stay for the long term. Perhaps the main reason why music therapy works is that music encourages self-expression in an indirect manner. Therapy is about helping clients understand and make sense of their thinking. However, thoughts and feelings that give life to addiction are typically highly negative and even traumatic. It is thus difficult for clients to examine these thoughts without triggering resistance. Music therapy helps clients examine negative thoughts in a natural manner that’s unlikely to trigger resistance. Once clients have benefited from music therapy, they are then typically more likely to better progress with traditional talking therapies, because music therapy has served to desensitise clients to their own negative thoughts and feelings. Negative thoughts and emotions that fuel addiction includes anger, guilt, shame and self-hatred. These negative emotions block clients from expressing themselves in a positive and creative manner. 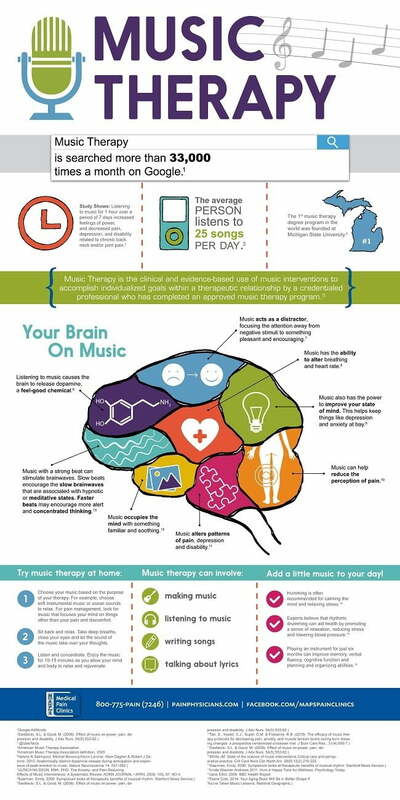 Music therapy helps clients overcome these mental blockages and build the necessary strategies and toolsets that prevent these blockages from returning in future. Music therapy also helps clients grow from a spiritual perspective. Given that we live in an age where harmful medications are often relied upon as the de-facto form of addiction treatment, we feel that the growth in music therapy as an alternative should be welcomed by all who are involved in professional addiction treatment. How is music therapy implemented? Music therapy is commonly mixed with art therapy. Art therapy is another distinct form of holistic therapy that’s gained popularity in addiction treatment circles over the last few years. Art therapy is similar to music therapy in that its commonly utilised as a complementary therapy to prepare clients for more invasive forms of talking therapies. Art therapy is often combined with music therapy by asking clients to draw or colour whilst they listen to music. Combining music therapy with art therapy is highly meditative and encourages positive introspection. Music therapy may be utilised as a mindfulness exercise. Mindfulness helps clients abandon negative thoughts and feelings by drawing their attention to the present moment. Mindfulness is highly beneficial for people affected by addiction because negative thoughts and feelings tend to be the primary cause of addiction. By focusing attention on the present moment, clients will begin to recognise these negative thoughts and emotions and they arise and then fade away.